2 channels with 50W lamps all five 12AX7A and two 6L6GC. XLR output with cab simulation, the power stage can also be set to "mute" to use only the output. 4 Switch the footswitch can be controlled via midi. With Noctch equalization is very powerful, but it takes a little time to get used to, this is not Plug-n-Play. It should also make these settings interact with damping. Pity that the Boost is not adjustable and is common to both channels, it would have been nice for solos. There it just adds 6db gain on the clean channel that in a situation is not very useful if you do not do much cruncher this channel. The dedicated switch on the footswitch is therefore not very useful I think. In addition to the footswitch, casters and cover come with, it's very convenient for transportation. For a project psychedelic Eastern, I needed a big sound and a great clean channel, mission accomplished! The clean channel is very dynamic and powerful. Very versatile, it works nickel surf rock or country for example. For cons, I have not managed to get him a very warm welcome at his montgommery wes jazz, it's not a blues deluxe anything. The past 10am gain it starts to crunch very nicely to the big overdriven AC / DC, grain carves very efficiently via the equalization trinity - notch - damping. On this channel, distos pedals work just as well, but do not use Bright, it's screaming otherwise. On the second channel with the gain at 11am we already enjoy with Palm Mute. Notch at 3 o'clock and we have dug medium metal sounds very encouraging. Slipknot granted drop B, it's great! The grain is very tight and can sometimes seem a bit cold in some settings, this is where the damping makes good service and the medium colors more smoothly once a tightened. The notch on the other side, it sounds more "hard rock" - Van Halen ... etc. I also like how it sounds but it is not my field, I have less explored. In any case, once again it is right and it does not bleed at all. The Violin is very good, excellent diffusion on stage, especially once embellished. 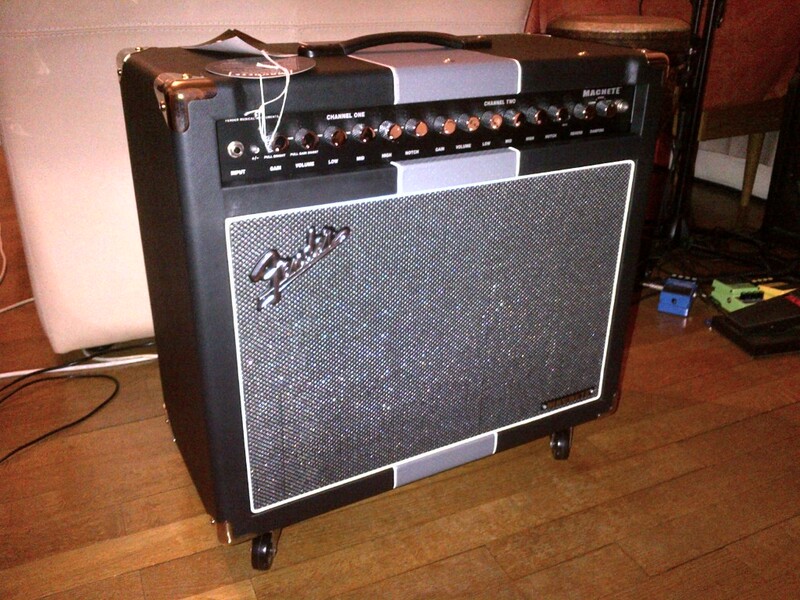 Another nice thing, unlike habit fender, this amp can be set to low volume, and really sounds great like that. It is not obliged to decline background equalization not to become deaf in confined spaces. By simulation against cab was a bit disappointed, the plugin logic sounds much better. But it is not very serious as it sounds good at low volume, it may very well bosser home studio. 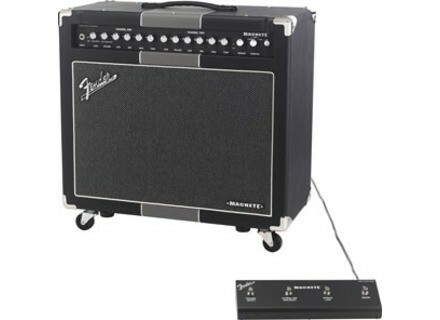 Yes, but here, I have tried many things in marshall, orange, mesa-boogie, the fender hot rod or supersonic before making this purchase, and I did not find any amp that combines clean to my taste with a true High gain. 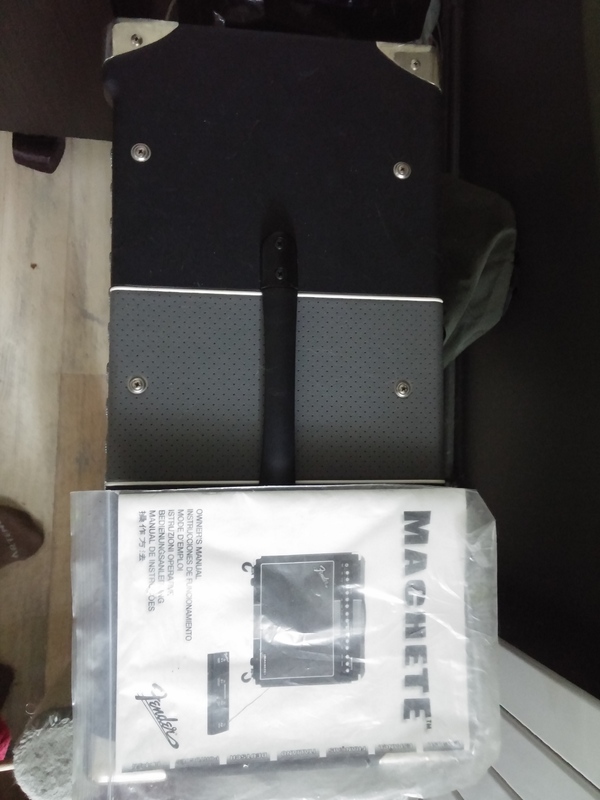 I think a second gain / volume on the light instead of the boost channel is missing, this amp would have reached perfection ... for 4 months but I use it, I like more that comes out of this babasse. It is not given, but it exudes quality and it sounds terrible ... then yes, I do it again this choice! Pierre666's review (This content has been automatically translated from French)" Side versatility, it did the job!" Fitted with a Celestion Vintage 12 "
- Damping adjustable to refine the interaction "power tubes / HP"
- Jack "effect loop send"
- Jack "return effect loop"
The config is very simple, no need to spend hours in the doc (the rest very brief). Thanks to the highly effective tone controls and notch it passes easily warm tones with clear sounds crunch in channel 1, then the very big sound in channel 2. 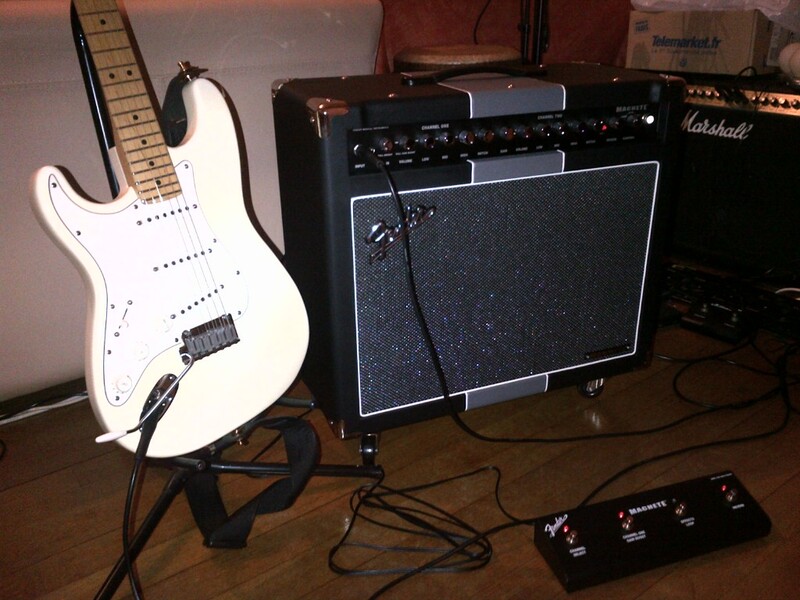 The reverb is very effective and the fact that it prevents digital noise nuisance of spring reverb. 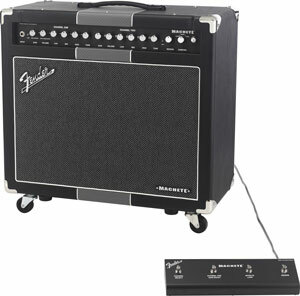 This amp is a versatile without falling into his Fender absolute super hot to Stevie Ray Vaughan was still in the side Fender clean tones, but with big sound heavy on the saturated channel. The dynamics are excellent. I play on a U.S. Standard Strat, and if I add the "bright" channel 1, the notes are absolutely striking 3 strings on the most acute, it smacks of fire god! Corrections tone bass / medium / treble are very efficient and adds another notch versatility, because of his passes in his Messa Boogie Vox just playing it. Strat in combination with clear channel bass and treble to bottom, and medium to zero gives a very hot where the lamps is best expressed. With distortion, even with my single coils, I approach the big humbucker sounds, and this is what I wanted. I use it for a few days. I played a Marshall Valvestate 8240 hybrid stereo chorus (I always), and there is no comparison as the warmth and dynamics of a phenomenal all-tube amp to completely downgrade transistors (albeit MOS-FET), and even if Marshall hybrid is equipped with a 12AX7 preamp. 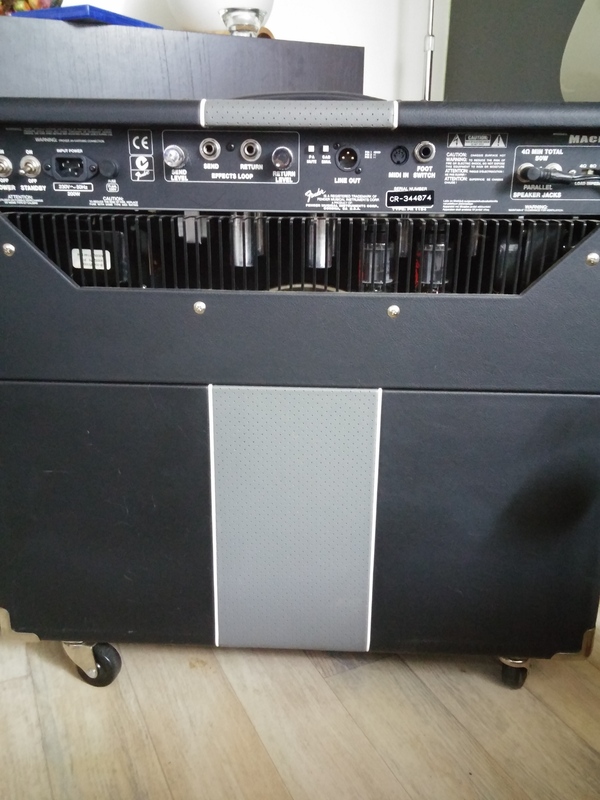 I was looking for an amp versatile that I can play Mark Knopfler AND the Angus Young: this amp perfectly fulfills this role. We can discuss the look (actually very debatable! ), But once connected, it is secondary and ears are taking over! I would do this choice without hesitation, and at this price, it is no more expensive or cheaper than all lamps at the same level. Comments about the review: There Will Be Blood!